Layer Marney Tower01206 330784work Historic SiteLayer Marney Tower near Colchester in Essex is the tallest Tudor Gatehouse in the UK, a magnificent building standing 80 feet tall within stunning grounds. The Tower stands on the shores of the river Blackwater, and construction was initiated by Lord Henry Marney in the 1520s, a close friend of Henry VIII. The Gatehouse and ranges which were continued by his son after his death were supposed to be part of a grand palace, but construction ceased after his son's death. What stands today is a glimpse into the luxurious aspirations of a 16th century lord, now a family-run venue which opens its doors to the public at certain times of the year, and it still does not fail to impress.
" Plays, shows and re-enactments are often put on in the grounds, with costumes to make you wonder what century you have travelled to.
" 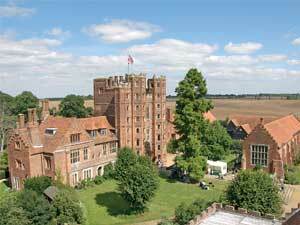 If camping's not for you, then try glamping in Layer Marney Tower Grounds. It's all the excitement and wildness of camping, with less cold showers and bugs. Layer Marney Tower near Colchester in Essex is the tallest Tudor Gatehouse in the UK, a magnificent building standing 80 feet tall within stunning grounds. Layer Marney Tower is open to the public on Mondays and Sundays in May and June, as well as on special occasions such as Heritage Open Days and Invitation to View. It can be hired out privately for weddings and functions throughout the year.